Share the post "Album review: LAURA MEADE – Remedium"
Anyone heard of New York-based progressive rock band Izz? No, me neither, but they’re another in a long line of bands inspired by the pioneers such as Genesis, Yes, King Crimson, ELP, and Renaissance. 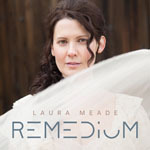 Laura Meade, one of the band’s two female vocalists, has now set sail with her maiden solo album, perhaps not so single-handedly as it features many of the band members – most notably multi-instrumentalist hubbie John Galgano on bass, keyboards, acoustic guitar, and drums, with cameos from Paul Bremner and Greg DiMiceli (electric guitar and drums, respectively on the mildly Genesis infused ‘Never Remember’), and Brian Coralian (drums on ‘Conquer The World’), as well as contributions from Randy McStine (electric guitar on ‘Sunflowers At Chernobyl’), Jason Hart (Renaissance, Camel) – keyboards and string arrangements on the shimmering ‘Irradiation’, and Greg Meade (other worldly electric guitar on the broody ‘What I See From Here’). And an immensely fine piece of work it is too. Combining Meade’s love of art rock and musical theatre, Remedium is not like most singer songwriter solo albums – there’s some wonderfully understated ‘progressive’ accompaniment that is quite stunningly delivered, and Meade’s vocals are in turn ethereal, operatic, and enthralling. An incredibly mature, expansive, and ambitious release, it features extended pieces such as the mesmerising ‘Sunflowers At Chernobyl’, and the hypnotically majestic ‘Dragons’, alongside more familiar length three minute offerings like the acoustic ‘Home Movies’, and the playful ‘Conquer The World’. But whether it’s long or short, progressive or simplistic, the playing, singing, and uncluttered production is head and shoulders above that you’ll hear on most releases with every note and nuance exposed and adding value. The result is that Remedium shines like a beacon in a sea of has-beens, wannabes, and recycling. An individualistic, innovative work of considerable beauty, it’s impossible to pigeon hole, or adequately describe, but, safe to say, it would sit more than comfortably next to Renaissance’s hugely impressive Symphony Of Light (2014). This entry was posted in ALBUM REVIEWS, ALBUM REVIEWS (Mobile), All Posts and tagged album, ambient, Izz, Laura Meade, prog, progressive, Remedium, review, singer, songwriter. Bookmark the permalink.